Curaçao’s cruise terminals provide adequate facilities to embark and disembark passengers. Over many years different lines have used the facilities to board their ships for safe travels, due to a good infrastructural connection between the seaport and the airport and a top-notch hospitality industry on the island. The MV Freewinds started its home-port operations 25 years ago on Curaçao and still uses Willemstad as its embarking port. 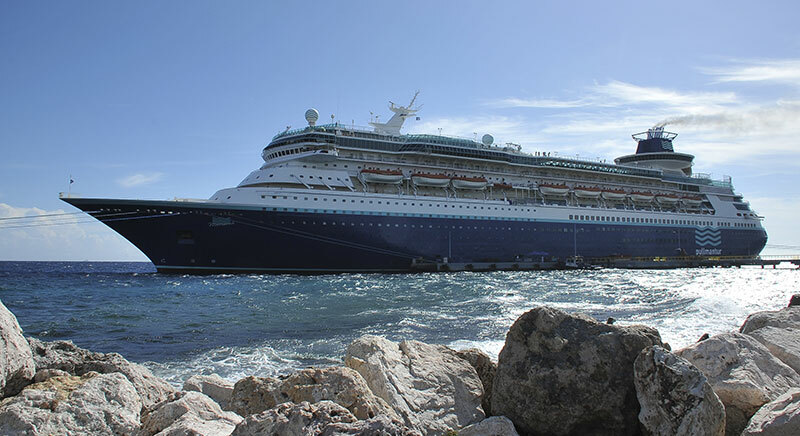 Pullmantur Cruises, with its Monarch vessel, can be boarded from Willemstad, Curaçao and continues to Panama (Colón), Colombia (Cartagena), Aruba (Oranjestad) and Venezuela (La Guaira), before returning to Curaçao. The vessel currently calls the port of Curaçao weekly on Wednesdays arriving at 8:00 a.m. and departing at 4:00 p.m.
Customs and Immigration offices are conveniently available at both the Mega Pier and Mathey Wharf Terminals. Passengers embarking the Monarch from our terminals can check in from 12:30 p.m. – 3:00 p.m. and need to present a valid passport and the booking reservation with the cabin number. Passengers that disembark in Curaçao will have to pick up their luggage at the terminal and pass through Immigration and Customs for inspection.